Home » Blog » Media » Social Impact 2013-14 and an exciting announcement! But perhaps most of all… as part of the report’s launch we are excited to announce that we will now start converting to a Community Interest Company – a legal form which allows us to formally lock in our social mission for the future. Education and youth ‘think and action-tank’ LKMco today published its 4th annual social impact report. 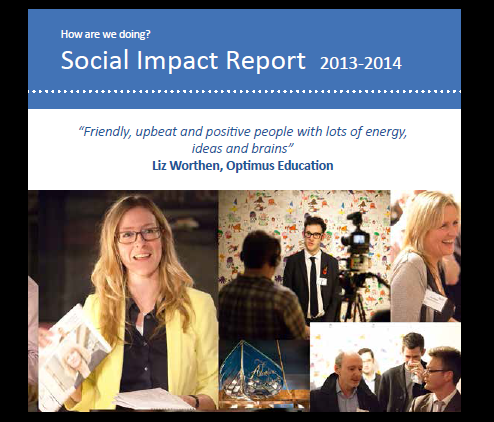 It tracks the social enterprise’s impact over the last four years. Director Loic Menzies welcomed the report and took the opportunity to announce that after six years in the sector the organisation would now embed its social purpose by converting its legal structure to a ‘Community Interest Company’. This will ensure that at least two-thirds of any profits are used for social benefit and that the organisation’s assets are locked into the organisation. LKMco has published annual social impact reports every year for the last four years and the latest report shows increased impact on eight out of ten indicators. In April this year, the SE100 index of top social enterprises placed LKMco in the top 100 social enterprises nationally and the top twenty in the education sector. “We are committed to combining high profile, rigorous research and policy advocacy with practical support for the education and youth organisations that are making a difference to young people’s lives every day. Over the next few months we will be publishing reports that cover crux issues in the sector, including reforms to Special Needs Education, school leadership in London and what motivates teachers’ to teach in different parts of the country. As the scale of our work increases we are confident that our impact will do so too. Tracking our impact over time is crucial in helping us monitor this”.